Marvel’s The Amazing Spider-Man and Invincible Iron Man now have three issues in circulation. Dan Slott and Brian Michael Bendis each offer a glimpse into the life of tech moguls, corporate espionage, terrorist organizations, and — most importantly — the heroic men who must navigate the playing field. Just as Peter is out of his element as the CEO of a major corporation, Mr. Slott seems uncomfortable with the kind of story he is writing. Before getting to some getting into details as to why, exactly, this story seems primed to disappoint, we must first ask the question: Why does Peter Parker keeping responding to blatant insubordination with an impotent line or two about needing to “talk”? The situation’s strangeness is compounded because, on some level, Mr. Cole has a point — Spider-Man and The Human Torch were seemingly destroying Parker Industries just to blow off frustration. The “fight” is stopped at one point so Peter can take a call from S.H.E.I.L.D., and then resumed like Rocky Balboa entertaining Apollo Creed’s “favor” fight at the end of Rocky III. Does The Amazing Spider-Man want to take itself seriously, or does it want to treat its subject matter as something a bit more farcical? Dan Slott doesn’t seem to know, and the result is a disjointed tone. Consider yet again the difference between Invincible Iron Man and ASM. 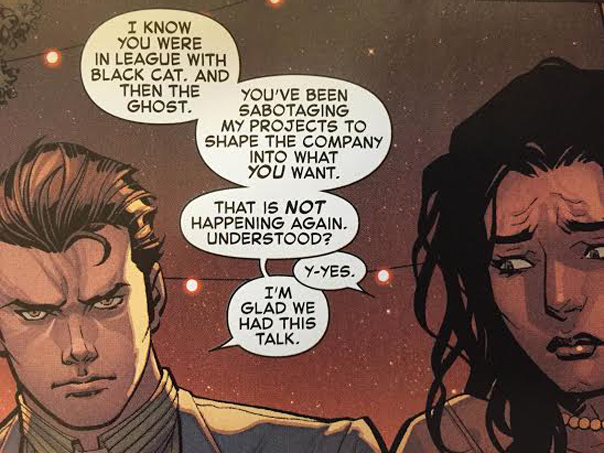 Everything that is revealed in Bendis’ book appears to be there for a very specific reason. 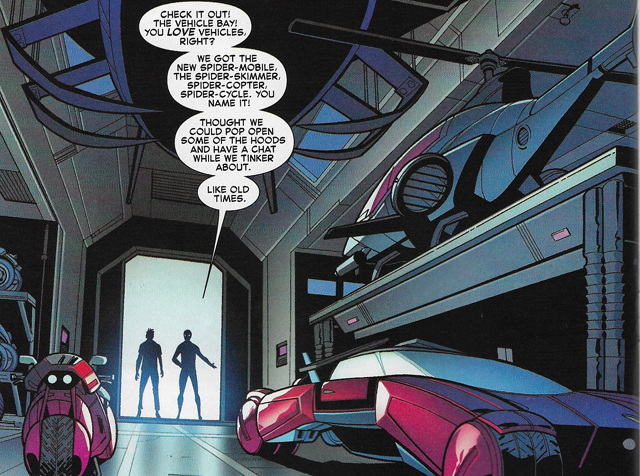 With ASM, it seems as though Mr. Slott just keeps giving Peter more widgets and gadgets and technology for nothing more than a “Wouldn’t it be cool if Peter had Batman’s toys? !” mentality. One gets the feeling that Bendis actually does legwork into corporate titans and terrorist networks. Mr. Slott seems to rely on preconceived notions about what those worlds might be like based on cursory knowledge obtained through network news. In my last review I mentioned that it was only a matter of time before Dan Slott gave Peter Parker Elon Musk-like Spider-Rockets. We now have a “Spider-Skimmer.” How far down the campy hole will Dan Slott go? Only he knows. Perhaps the biggest obstacle to this story arc’s success is its main foil: The Zodiac. The characters look and act goofy, yet all indications point to revealing the terror network’s plans over many months. That is a lot of creative real estate. Will it be worth it? ASM has a track record of over-promising and under-delivering; The Zodiac does not inspire confidence anything is destined to change. 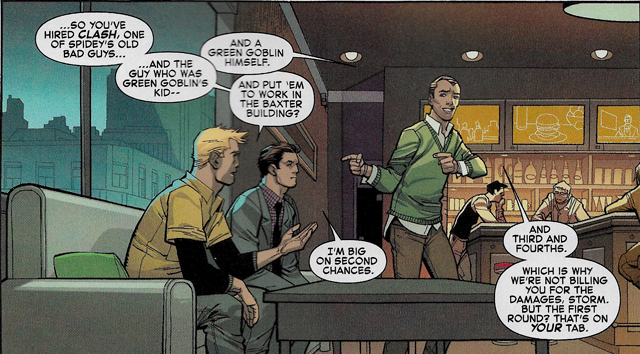 The issue ends with Peter, Johnny, and Harry ‘Lyman’ (Yes, a former Green Goblin employed by Parker Industries — but wasn’t he running a coffee shop not long ago? ), talking about family, friends, and “fourth” chances. Readers can’t help but think of the repeated chances they have given Marvel with its ASM relaunches. Editor’s note: I will be reviewing the third issue of “Invincible Iron Man” by Sunday. Next Entry Dan Slott eviscerated after cyber-stalking Philly charity runner; industry ‘journalists’ M.I.A. Marvel should just knock Slott off of Spider-Man already and let someone decent write him. Bendis or Waid maybe? 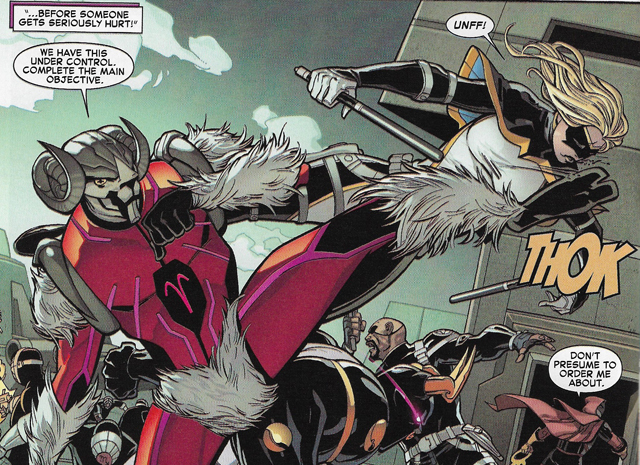 With Slott I never think “focused.” Has has been very open about how he plans things far ahead. That’s fine, but I often feel a though the present stories suffer in quality because his creative energies are focused on whatever development might amuse him three years down the line. Do the job at hand well, and then move on to the next thing. I just don’t like how he writes Spider-man. Superior Spider-man was great story so I gave him another chance with the Marvel Now!’s ASM first trade and it was terrible. He writes Peter Parker like a man child or something! And now he’s turning Peter Parker into Batman! I’m done with Peter untill Slott get’s the boot, Miles Morales is my current Spider-man. Now he’s turning Peter Parker into Batman! The weird thing is, I can tell that he enjoys this idea. Technically, the writing is an improvement over pre-Spider-Verse…but is turning Peter Parker into Spider-Batman a good idea? I’d rather not. That’s putting it nicely. I did like bits of this issue, but when the best part is Peter unveiling the statute of the FF and holding the readers hand assuring them a better developed super-group will be back to their best soon, it does raise an eyebrow over what we’re supposed to focus on. Also, the inconsistency with Harry bugs me….last time he cameoed he looked like Walter White from Breaking Bad, now he’s back to his usual look…and what was with changing his surname to his mother’s maiden one? If he hasn’t changed his appearance to lay low (where as he did once previously), why should he bother with his name switch? I think Dan Slott does “whimsical” well. He does nostalgia well. For instance, who doesn’t smile when they see The Human Torch trapping himself in the same containment chamber that once held teenage Peter Parker? Who isn’t going to appreciate that Peter Parker — the nice guy that he is — would do something nice! (e.g., create a monument to The Fantastic Four in The Baxter Building). On some level, these things are the easy layups of a Spider-Man book. They also inoculate the writer from a certain amount of criticism because in each issue Dan hits 3-5 “layups” in a row. He’s scoring points, but he’s taking the open shots. When it comes to the more difficult shots — the ones that require intense focus to pull off — he’s usually way off the mark. It was a nice moment, I guess, but did you know what was going on with the FF? 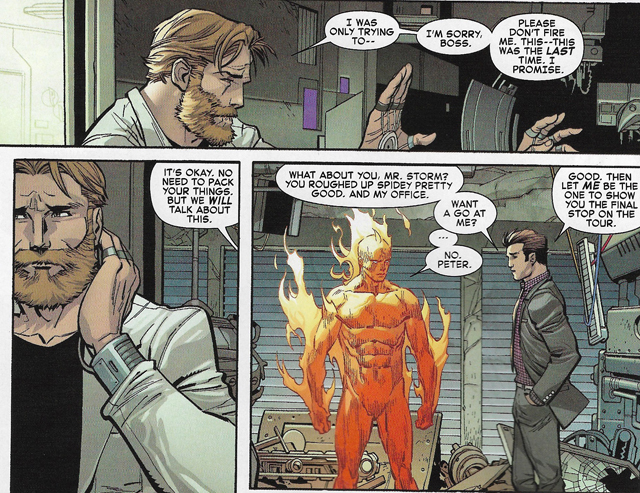 I skimmed this one at a shop and I thought the stuff with Human Torch was confusing. I have no idea what’s up with the FF and the issue explains nothing. As much as the asterisks can get annoying, I have no idea why the Baxter Building was up for sale, why Johnny is so angry, etc. Also, where did this come from? The first two issues were about Peter going after a terrorist group. Usually, if you want to have an issue where two friends have a conflict and work out issues, you’d think you’d wait until there was a lull in the main plot to do that. This issue is a complete change from the other two. To the extent that it advances the main plot, it does so by having Peter be totally ineffectual, dropping everything to have an argument with his buddy, while the bad guys are making progress (and kind of craps on Mockingbird, considering how lame the Zodiac guys have been so far). That one is on Marvel. I agree, that was weird. I’m guessing it’s because the release dates for Secret Wars are all screwed up. Great job, Marvel! Heh. You’ve identified another possible pitfall of Peter having this global tech empire. If Dan isn’t careful, he’ll just have Peter bouncing all over the globe in a way that doesn’t move the plot forward. If done incorrectly, it can certainly kill momentum. I’m already totally confused about the situation as regards his company, where it is, who it is, etc. They treated the Chinese office like it was his head location in the first issue — I thought he lived there now or something. Why else would he bother learning Mandarin specifically if he can just hire people to translate at his satellite location? Why would his girlfriend be in China specifically if it’s just one of many locations? We now have a girlfriend (I guess?) in China, and his best friend in New York. The Zodiac people have attacked in China, in a submarine someplace, and a SHIELD helicarrier somewhere. I don’t know where they are, where they’re located, where Peter is, how Peter manages to be in China when the Zodiac are attacking there if that’s not his main place to be, etc. Stark has a supersonic set of power armor. I can accept that he just gets places when he needs to; and even then, when he’s not in space he stays in the US almost exclusively. James Bond is a spy who hunts down terrorist networks; he has info about the people he’s going after, and he’s usually working to prevent something that’s going to happen. Batman has access to teleportation. Spider-Man has always been a reactive kind of guy — Doc Ock is attacking something, he swings in and stops him. How does that work if somebody attacks in China or India or Mexico if he’s headquartered in New York? Was he in China just for that one operation? If so how is he so “close” with one of the employees there? Basically I have no idea how this concept is supposed to work. It seems like the globetrotting thing comes and goes based on what’s currently convenient. You’d think people would catch on if Peter Parker keeps going to places just so his “bodyguard” can do superhero stuff in those places. I pretty much had the very same problem you did when doing my own review of this issue. Because even if Reed, Susan, and their two kids are missing or presumed dead, that would still mean Johnny, as their next of kin, should be the legal owner of the Baxter Building. Which means if anyone, including Peter, wanted to the buy the property, they would have to approach him. Granted, there is that eight month gap, and a lot can happen in eight months. And, as Doug points out, that eight month gap is not the fault of Dan Slott but of Marvel decision to expand Secret Wars from eight to nine issues which have resulted in constant delays of the main series. It’s pretty obvious ASM #3 was produced under the assumption that Secret Wars would already be over by this point, but since it’s not, were now left with the problem of not empathizing with Johnny’s anger because we still don’t know what happened to the FF during that missing gap of time. I think Slott has good big picture ideas but he fails in the execution; he forces characters to act out of character to fit the narrative. Slott can write well but it is very hit and miss. SSM was some of his better work but that may be due to the fact that he was not writing Peter. Superduperawesomeguy, I do not think you want Waid on the book, the Spider-man issues that he did write were far from good. I agree with you 100% with that said he needs a filter. I think Dan needs to take classes on professional behavior. Slott’s Spider-Man stories remind me of the Roger Moore Bond movies. They’re a mixture of violence, explosions, and jokes, but they have no heart.